Intercomp PW800 pallet jack scale 123000 features Integrated load cells to existing 27"x48" forks to weigh pallets on the go. 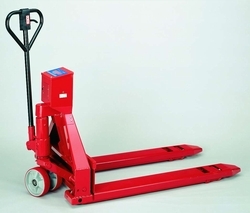 Lowest profile at just 2.9 inches in lowered position ensures entrance to virtually all standard pallets. High accuracy with 5000 lb capacity in 1 lb. increments, gross, net, tare parts counting and weight accumulation features. Units: Lb / Kg, Large easy to read .8" LED display, Function keys: TARE, LB/KG, ZERO, MODE, SET, ON, OFF. (9)D Cell alkaline batteries, up to 40 hours continuous use or optional rechargeable nickel cadmium batteries, Automatic shut off after 5 minutes of non-use (up to 30 minutes). 16 hour charge time. Features 2.9" lowered height and is 7.8" at the highest point. Accuracy +/- 0.1%, 1 Year mfg. Warranty. Ship Wt Approx: 300 lbs. Ships by LTL motor freight.